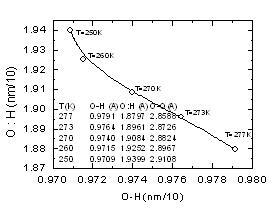 The melting temperature Tm of ice Ih was determined as 411±4 K for the Becke–Lee–Yang–Parr density functional.1 Thus, we performed the ab initio MD calculation on 96-molecule super-cool water under 400K using CP2K package with BLYP density functional. The structure was relaxed in NPT ensemble for 15ps with 0.5 fs of each step to reach to a converged T, P and energy. The bond length distribution was taken from the last 5ps (10,000 steps). The power spectra were calculated using the Fourier transformation of the autocorrelation function of the velocities from the last 10,000 steps. 1. 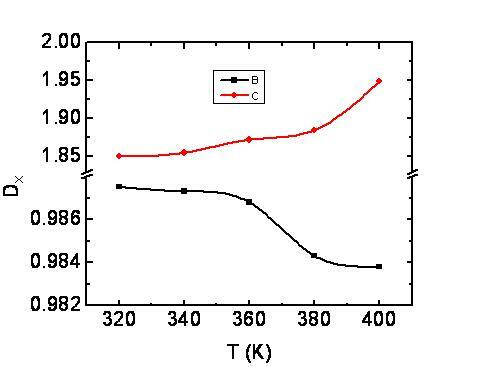 Yoo, S., On the phase diagram of water with density functional theory potentials: The melting temperature of ice Ih with the Perdew?Burke?Ernzerhof and Becke-Lee-Yang-Parr functionals. J. Chem. Phys. 2009, 130, (22), 221102.